Looking for different career options? Below is a summary of the herd owning roles in the dairy industry, including pros and cons. Investigate the different farm business types below and consider what would work best for you. The sharemilker supplies the herd and operates the farm on behalf of the farm owner, the sharemilker receives 50% of milk income and all money from the sale of livestock. Under a herd owning sharemilking agreement, the sharemilker traditionally received 50% of payout. Herd owning arrangements can range between 40 and 60% of milk price and the dividend may or may not be included in the sharing of income. Need clear agreement on who will cover what costs, especially bought-in feed and maintain soil fertility etc. Each party knowing their obligations and responsibilities will enable the relationship to run as smoothly as possible. Given the importance of budgeting in negotiating a viable contract for both parties, getting professional advice on this is recommended. Following a process of due diligence before signing agreements will help improve likelihood of success for both parties. A thriving business relationship between two parties is likely to be one where goals and values have been shared and are fairly well aligned. The key drivers for the herd owning sharemilker are the cash returns from their business, and the ability to build equity through herd ownership. Equity requirements for purchasing livestock are higher than those for farm land. Livestock assets averaged $814,000 between 2011 and 2016 for an average NZ HOSM. Equity of a minimum of $500,000 is likely. For a detailed financial example view the factsheet here. Contracts are for a given term with a simple and proven entry and exit process. Timing of entry and exit is critical for HOSM due to fluctuating livestock values. This can seriously erode equity for the HOSM. A contractual arrangement where the farmer managing the property is paid on a percentage of milk income e.g. 45% of the milk income. The herd owner (or variable-herd owner) through agreement provides cows, labour, shed costs, electricity, transport and sometimes a share of the feed and fertiliser costs. Herd owning sharemilkers typically make a greater return on equity invested than farm owners, and accept a higher degree of risk. No two variable rate HOSM positions are equal. Some farms have excellent infrastructure, good contour and productive pasture other farms can be more challenging resulting in higher farm working costs for the sharemilker. In some cases, receiving a lower milk income percentage on a well set up farm will still be more profitable to the sharemilker than receiving 50% of the income on a more challenging farm. An example of a variable rate agreement might result in the farm owner receiving 55% of milk income compared to 45% to the sharemilker. Costs may be split 50% each between the parties. Can increase the financial returns for a well set-up and productive dairy farm owner. May allow a herd owning sharemilking position to be created or maintained when it would otherwise not have been viable, e.g. for those with high debt. Allows the farm environment, contour etc. to be taken in to account to ensure a fairer division of costs and income. It is very important that a detailed budget is completed by both parties to understand the viability before making a decision on percentage share. Farm owners must understand that not all farms are equal, it may not be viable for a sharemilker to receive a reduced milk income share on more challenging farms or those with higher farm working expenses. A detailed budget is required to assess a fair and reasonable percentage share for each party, getting professional advice on this is recommended. When deciding the percentage shares both parties should have a clear understanding of what the net financial result will be for their business rather than focusing on the share of milk income as a measure of success. A variable rate herd owning sharemilker offers cash returns from their business, and the ability to build equity through herd ownership. Equity is required. The following comparison highlights the difference in returns between a 50:50 and a 45:55 herd owning sharemilking contract. Contracts are for a given term with a proven entry and exit process. A variable milk price sharemilking agreement whereby the percentage paid out to the sharemilker and landowners varies according to the milk price. The aim is for a fair return on asset to land owner (5.8%) and sharemilker (9%). It involves full disclosure by both parties of the farm budget to determine the farm working expenses. The flexi-rate HOSM agreement is currently a concept developed by MyFarm, a farm investment and consultancy business. The financial examples here and in the associated fact sheet are therefore modelled and not based on real farms. The objective is to reduce the variability in the profit range for the sharemilker. This is achieved by sharemilkers receiving a higher percentage of the milk cheque in low payout years but receiving a lower percentage of the milk cheque in higher payout years. The system recognises sharemilkers typically have a higher cost of funds due to a higher risk profile (compared to farm owners). A full farm budget is prepared for the farm business prior to the start of the season. The value of assets being contributed by both parties would also be agreed. A table of each party's share of the milk revenue is built based on the initial milk price forecast. As the milk price forecast is altered through the season there is a requirement for a retrospective adjustment for the season-to-date milk revenue. The final adjustment will not be known until September of the following financial year. Receive greater protection (and share of revenue) in low payout years. However, in the high payout years they will receive a slightly lower percentage of the milk revenue. Possible to buy part of the herd, not necessarily the whole herd, when starting out. Grow stock numbers or purchase more cows over time. Release capital by selling herd or part of herd to a sharemilker. Work with an experienced sharemilker who has a stake in the profitability of the farm. Landowners will receive in most years a slightly higher percentage of the milk cheque. The process is reliant on full disclosure by both parties of their farm working and capital positions. The process requires recalculating and reconciliation payments during the season if the forecast milk price changes. Financial impact of the variation in the milk price on each parties’ budget. Setting up for the season, monitoring and reconciliation payments require input from an advisor. Sharemilkers are exposed to a higher proportion of the farm working expenses and do have a higher cost of funds. However, division of expenses is agreed at start of contract. Having a third party manage the calculations is likely to be important. Share of milk revenue graph below gives an overview of the potential share of milk revenue at a range of milk prices under a flexi-rate agreement. Information provided by MyFarm shows the sharemilker revenue split could range from a 62:38 split in favour of the sharemilker at low milk prices, in the order of $4.00/kgMS, to a split of 41:59 in favour of the landowner at milk prices approaching $8.00/kgMS. 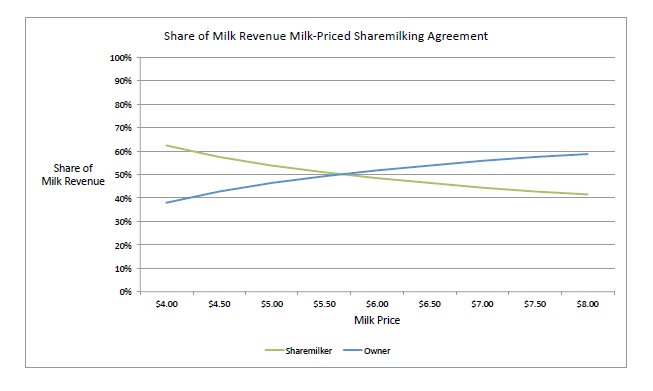 Sharemilker profitability ranged between – 0.3% to 13%. Farm owner profitability ranges between – 0.2% and 8.8%. The approach is essentially removing some of the downside risk for sharemilkers, and as a trade-off removing some of the upside rewards sharemilkers receive in high payout years. For more information see the fact sheet. In principle this arrangement will have no material impact on the ability of sharemilkers to enter and exit agreements beyond a standard HOSM agreement. The flexi-rate HOSM agreement is currently a concept developed by MyFarm, a farm investment and consultancy business. This information is a summary of a fact sheet located here. For more information on the flexi-rate agreement please contact MyFarm Business, Angie Fisher at DairyNZ (0800 4 DairyNZ), or your own farm consultant. Talking to trusted advisors or farmers with experience who have 'been there, done that' through our Dairy Connect programme will illustrate the realities of the different ownership models. Find out more here. For full descriptions of business pathways with advantages and considerations of each operating structure, explore our factsheets. Process for due diligence prior to signing agreements.